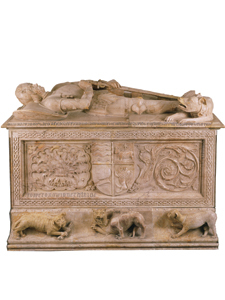 This sepulcher is sculpted in the Renaissance style, it is made of alabaster-a malleable material that allows for delicate detailing and a shiny finish. This is the tomb of Juan de Vargas. In 1525 he died and was buried in the Convent of Santa Isabel de Alba de Tormes, in Salamanca. He is identified by the epigraph inscribed on the top of the tomb. It was originally located below an arcosolium decorated with crests and ornamental plant motifs, with painted panels at the back. The deceased was a young man and his lovely features show a taste for naturalism. The head is modeled in such a way that it may have been intended to be a portrait. He is dressed in armor in the style of an early-16th century knight. A dog has been carved at his feet. A symbol of fidelity, the animal is charged with keeping watch over his master throughout his eternal rest. The front of the sepulchre features the family coat of arms surrounded by plant motifs. On the left, the papaver somniferum, or opium poppy, stands out. In the classical tradition, this flower is a funereal symbol. Juan de Vargas came from nobility. His family promoted this kind of funereal sculpture, which paid tribute to important noble ancestors. The inscription on the band to the right of the frame may have been carved by the man who is thought to have created the sarcophagus-a sculptor named Ruiz who has remained unknown until now.